A MUST TRY! They serve ribs with melted cheese, and then the ring outside is sectioned for eggs, a potato salad, sweet potato, and grilled corn. The ribs vary in spicy levels. We ordered the slightly spicy one and it was actually very sweet and mild. Our entire bill came up to be 62,000 won for 3 people. 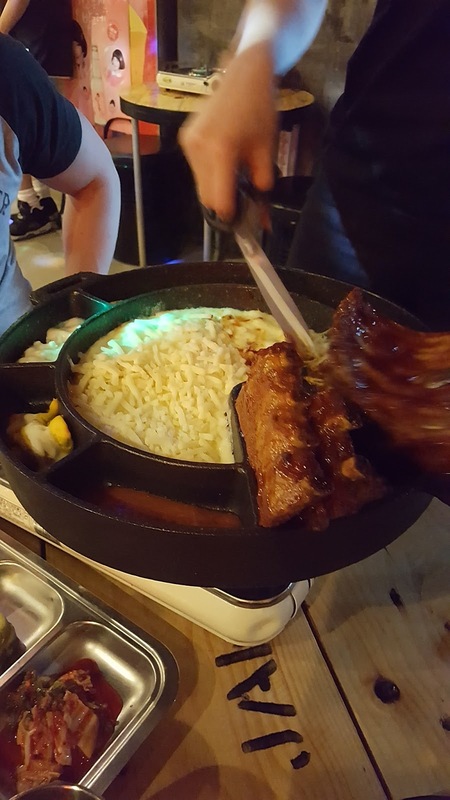 The sodas were 2,000 won each, beer and soju were both 5,000 won per bottle, and each serving of ribs (a rack of 4 ribs) was 16,000 won for the basic James Cheese Ribs. The ribs were very well seasoned and coated in a thick glaze that was mostly sweet, but with a slight kick of spice. 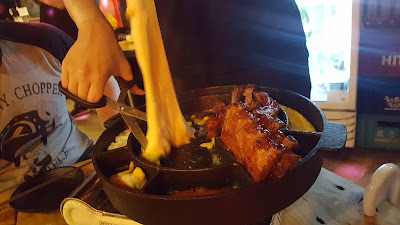 The downside to this dish is that the cheese hardens extremely fast once the waiter (or waitress) turns off the heat when the cheese is fully melted. The grilled corn side was really good too, and so was the kimchi. Wasn't a fan of the potato sides.